McWilliam’s work inscribes itself into a very long tradition that dates far beyond the strands of modernity and the concept of art as we know it, at the same time as he points to the most advanced scientific studies. In premodern cultures the cultic object would form a bridge between this world and the divine forces beyond human understanding. Today we investigate these fields in the context of consciousness studies, Superstring theory and quantum physics that all end up questioning the present view on reality. Both represent and materialize a connexion between the world as we know it, and the space that is beyond human consciousness. Compared to the cultic object, in a postmodern context McWilliam is able to create a similar passage, precisely because his works adapt and incorporate the postmodern reality. The play with dimensions openly tells the story of postmodern deconstruction, but still, essence has not been lost. The extended awareness that is created as time and space merge offers us a possibility to get in touch with those deeper layers of human existence. The most existential experiences expressed in the humble form of a vessel. Clay, water and fire. Form leading to the formless. Space dissolving space. Dr. Louise Mazanti. Writer and lecturer, Denmark. ​The process McWilliam uses to create his work is a planned excavation. The solid chucks of clay are formed, scored with a design, and fired. “Prepared surfaces are struck off after the firing with a hammer and a chisel to reveal an archeological looking core,” McWilliam explains on his website. 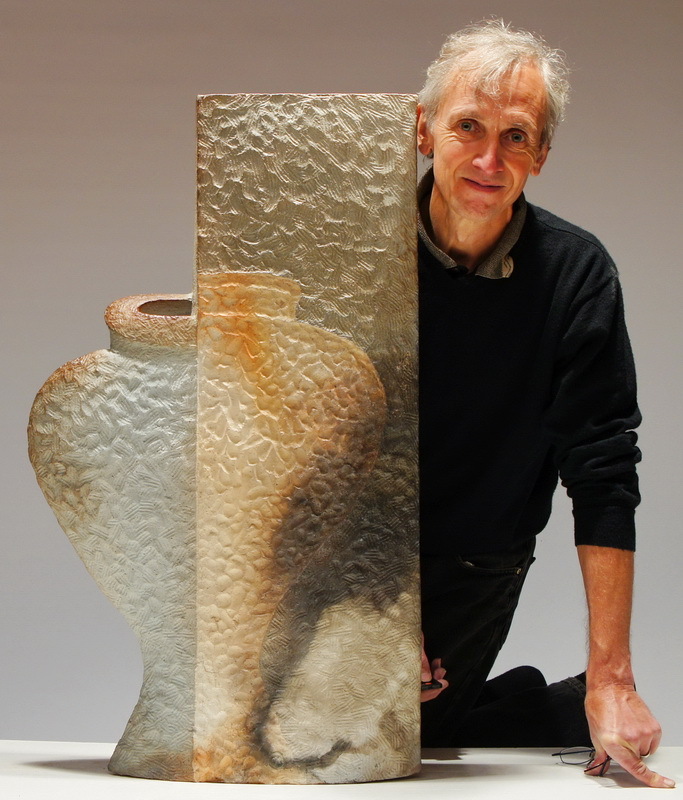 His process reveals images of pottery as well as abstract geometric patterns.His process is like a dark proactive civilization, designing their own discovery by future cultures. His objects are apocalyptic death notes. The iconic images are more brilliant than they first appear, depicting simple pictures of pottery, a basic human tool with a universal message. This icon is a hopeful commonality to the discovering future culture, a clue saying – “We are the same.” This unsuspecting consideration for future communication is also seen in the use of dense material to preserve his message. They make us wonder if McWilliam and ancient cultures were both writing to the future or simply to their contemporaries.McWilliam’s making process gives him two exhilarating experiences lived vicariously through the viewer. His first experience is creative manifestation followed by the excitement of exploration and discovery. It is a playful performance of an anthropological process that typically takes thousands of years and millions of people condensed into just a few weeks by a human with god-like powers.